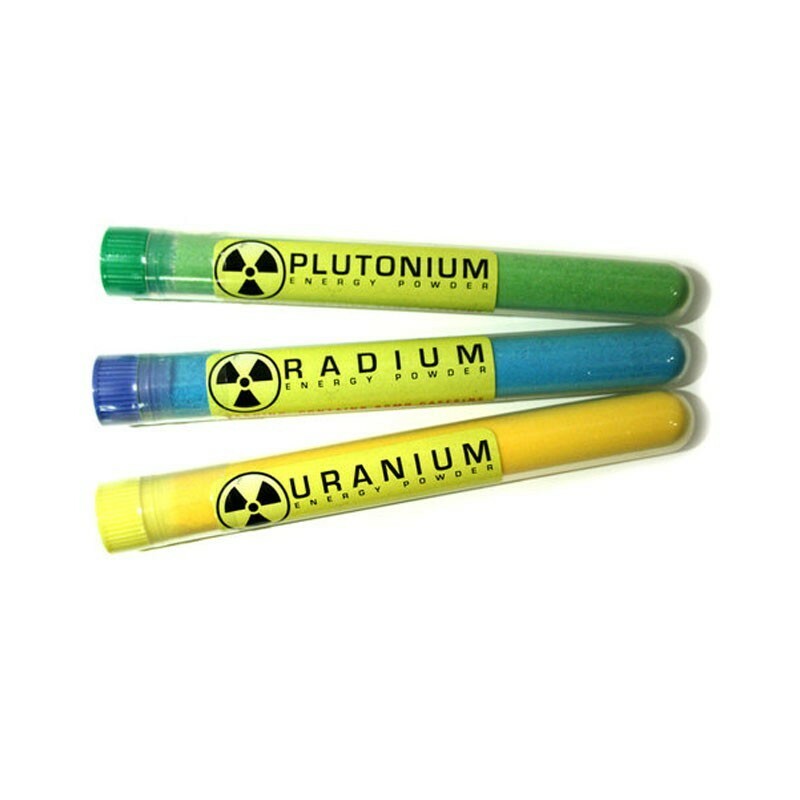 Pick your nuclear powder of choice... radium, barium, uranium, strontium or the new rubidium and gallium. Each tube of highly powerful powder is extremely delicious and safe to eat! With 90mg of caffeine per tube you can take in moderation throughout the day for smooth nuclear delivery or down a whole tube in one shot for a massive nuclear meltdown. Each powder has a sweet and tangy flavor - Radium Raspberry Lemonade, Barium Black Cherry, Uranium Yellowcake, Strontium Strawberry and two new flavors Rubidium Rootbeer and Gallium Grape (and you don't get that nasty "radioactive" aftertaste!) Note: the powder will leave a "radioactive trace" of color behind. Limited time only: The $50,000 nuclear shipping charge has been waived, and only standard shipping charges apply. Plutonium is no longer available. This stuff is awesome! Not only does it work, but it tastes great (except the Rootbeer - yuck!). Like pixie sticks that give you caffeine. One of my favorite caffeinated candies. Basically a big, caffeinated pixie stick. Good stuff, and the flavors are exactly what you expect for artificial strawberry, black cherry, etc. 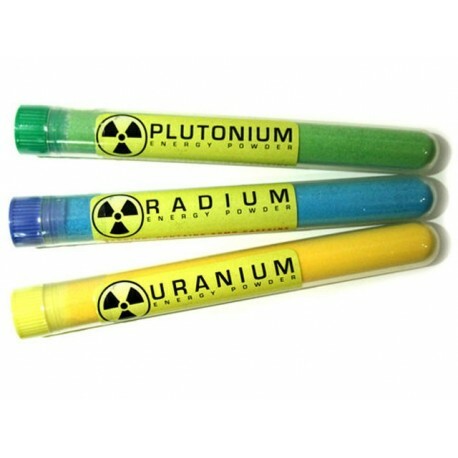 Uranium (yellow cake) is a let down, but the rest are good enough to give it an overall 5! Loved it! Kept me up until 7 in the morning but it tasted so good I had to force myself to not devour it like a pixie stick. These will make you glow, in more ways than one. It would be nice to see a sampler pack with all five flavours.